1. Please post no more than one nomination for the best review thread in our first year of the CCF (between April 30th, 2014 at 9:22pm EST and April 30, 2015 at 9:21pm EST). I'm going to nominate Roquefort Raider's Annotated Savage Sword of Conan thread. The reasons start with me being a Conan fan, but it is well written, show cogent analysis, is fairly objective, provides lots of samples of art and provokes a lot of conversation. There a lot of amazing review threads that deserve attention, and I'm sure a lot of them will get nominated; I wanted to make sure this one got some love. Seconded. Truly quality work that probably deserves to be published somewhere. There are so many quality review threads here that have all been the recipients of tremendous care and work, but I was ultimately torn between nominating two of them, and mrp just nailed one, so that frees me up to nominate crazyoldhermit's Garth Ennis' Punisher MAX thread. I'm not a fan of the Punisher, and I've never read a single one of these books, but his writing style was so engaging, concise, and informative that it absolutely kept me wanting to read more, and the little extras, like assembling a timeline, body count, and even a medical record were just pure icing on the cake. VERY fun. I nominate Slam Bradley for his SB Reads the Marvel Universe thread. Slam's reviews are well-written, incisive, and utterly untainted by nostalgia. I look forward to each new entry. I summon the good stuff, Maynard! Last Edit: May 16, 2015 7:22:37 GMT -5 by Cei-U! I was torn on this one but ultimately I had to go with Confessors Star Wars at Marvel review thread though if anyone were to nominate Shax's Batman thread I'd second that in an instant. Cei-U's Guide to Earth 2 is a wonder of scholarship we mere mortals are privileged to look upon. Talk about a guy who knows his stuff and how to present it! though if anyone were to nominate Shax's Batman thread I'd second that in an instant. To be fair, I've been neglecting it for the past three months. There's been so much great work done in so many other review threads that are worth noting. I'll nominate Shaxper's Batman #300 and up thread. It may not have seen much activity lately, but it's always an interesting read and a place that fosters some really good debate. I would like to remind you that this contest is to recognize contributions from the entirety of the last year, not just the last couple months. It was one member's try at a short review thread, and it was sensational. Spider-Man meets Shang-Chi, and Dracula! 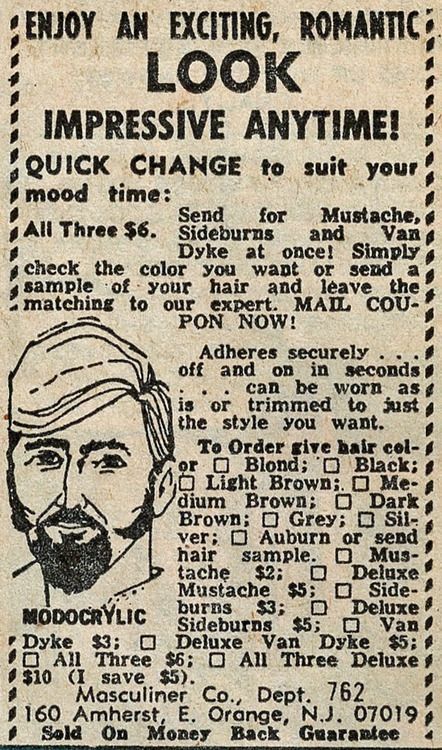 And it turns out you could order facial hair through the mail! One other thread I hope to see nominated is Scott Harris's Sort of Complete Original Life with Archie. Just too many great review threads around this place.